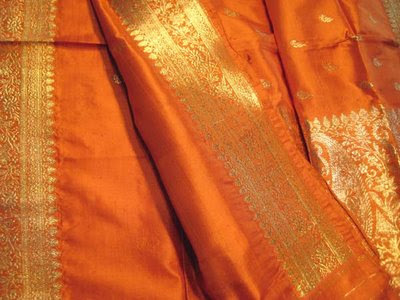 HINDU RITUALS AND ROUTINES...: What is importance of 'offering a sari' for the Goddess? Note: Ritual of 'offering a sari and a blouse-piece' is called as 'Oti bharane'. What is the importance of performing 'Oti bharane' in Goddess worship? Invariably offering Her a sari and a blouse-piece concludes the ritualistic worship of a Goddess. Offering this to a Goddess is akin to praying to Her attributeless form to work for one's spiritual progress and welfare through the medium of 'with attribute' form. Panch-opachar puja (worship by 5 characteristic sub-rituals) in any ritualistic worship is related to the attributeless form of God. The prayer to the Goddess to become functional, with the offering of a sari and a blouse piece helps the attributeless form of the Goddess to manifest in 'with attribute' form in the sari and the blouse-piece. C. Pray with utmost bhav (spiritual emotion) to the Goddess to bless you with chaitanya and for your spiritual progress. This helps manifest the 'with attribute' Goddess principle. D. After offering all the ingredients of 'Oti' at the feet of the Goddess, offer some rice grains on them. E. If possible, the lady offering the 'Oti' (only a married lady is permitted to offer an 'Oti' to a Goddess) should wear the sari offered to the Goddess as prasad (holy sacrament) and partake of the coconut too as prasad.